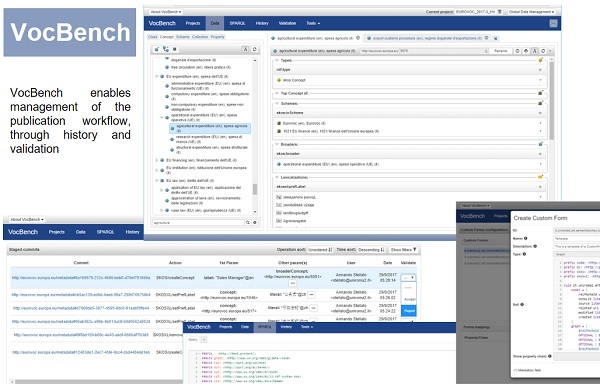 VocBench 3 - a free and open source platform for editing ontologies, thesauri and RDF datasets - is now available for download ! The VocBench team (at University of Roma, Tor Vergata) is pleased to bring this news: VocBench 3 (VB3) - a free and open source RDF modelling web environment for editing ontologies, thesauri and RDF datasets in general - is now available for download HERE ! The VocBench site has been updated to reflect the move to VB3, though it still provides links to past VB2 documentation for those users who will take some time before migrating to the new VocBench. The site includes basic introduction and download references, a user manual, a system administrator manual and a developer manual. There is still plenty of documentation that could be written. Moreover, after a decade of versioning 0.something releases, Semantic Turkey - the backend for the collaborative ontology and thesaurus management platform VB - has finally reached version “1.0”! Semantic Turkey has underwent several changes in the past years (with some years of pitstop, meditating on what it would do (when it would have "grown up"), starting from its original support to a semantic bookmarking and (later) annotation system, towards becoming a fully fledged RDF Services Framework for Knowledge Management and Acquisition. With the latest improvements (and reengineering), the VocBench Team brought in the context of developing VB3, and can finally consider this one to be the 1.0 version of ST.
With VB3, Semantic Turkey officially abandons its original Firefox UI. VB3 is today the main UI for Semantic Turkey ! And, surely not the least in importance, VocBench community, always rich in feedback and appreciation ! Dear VocBench Users, you are welcome to let VocBench team know your impressions about VocBench 3 ! Stellato, A., Turbati,A., Fiorelli, M., Lorenzetti, T., Costetchi, E., Laaboudi, C., Gemert, W.V., Keizer, J. Towards VocBench 3: Pushing Collaborative Development of Thesauri and Ontologies Further Beyond, Proceedings of the 17th European Networked Knowledge Organization Systems Workshop, co-located with the 21st International Conference on Theory and Practice of Digital , Libraries 2017 (TPDL 2017) VOL. 1937, pp. 39-52, 2017. European Interoperability Framework – Implementation Strategy (Communication) - 2 October 2017.